Cretan cheeses stand out for their stimulating flavor that will satisfy even the most demanding gourmand, thanks to the quality of milk and the methods used in their production. Sheep and goat milk is commonly used in various proportions. Dairy products were traditionally made in outdoor dairies up the mountains of Crete (known as mitata). 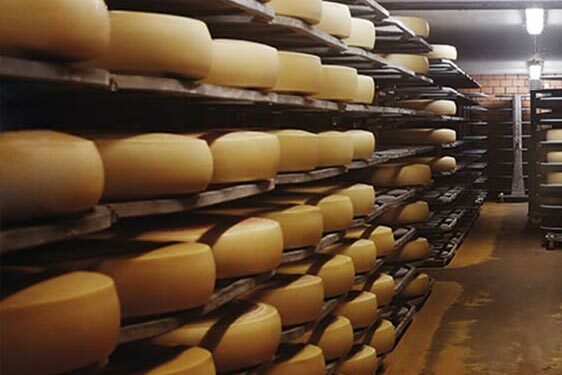 Today production processes are conducted in organized, certified and safe dairies. Graviera is the most popular Cretan cheese and one of the most well-known cheeses in Greece and abroad. It is a hard cheese with a pale-yellow color, left to mature for at least 3 months. It is characterized by a mild, sweetish flavor and intense aromas. It is produced from sheep or goat’s milk, with a maximum moisture content of 38%, a minimum fat content of 40% and a maximum salt content of 2%. Its name translates literally as “thick milk from Chania”, as it is produced exclusively within the Chania regional unit. It is a soft, spreadable cheese with a yogurt-like texture and slightly sour, pleasant and refreshing flavor and aroma. It is made with fresh or pasteurized goat or sheep’s milk, or with a mixture of both. It has a maximum moisture content of 65% and a minimum fat content of 50%. A soft cheese with a special reputation in Crete and high consumption in the domestic market. It has a pleasant sour and at the same time sweetish taste and a grainy to creamy texture. It is made of whey enriched with sheep or goat milk or a mixture of both. It is a Cretan favorite table cheese, widely used in traditional recipes. It has a maximum moisture content of 55% and a minimum fat content of 45%. Xigalo Sitias is a unique product based on a long tradition of livestock farming and cheese making in the region of Sitia in Eastern Crete. It is made of high quality sheep or goat milk (or mixture of them). It has a creamy texture and a rich, slightly sour and fresh taste. Maximum moisture: 75%, fat content: 33-46%, salt content: up to 1.5%. Cretans are fierce cheese lovers and always accompany their meal with some sort of cheese. They even eat cheese as a dessert (topped with honey) and many local traditional recipes for sweet or savory pies are filled with various cretan cheeses (mizithropites, Sfakianes pites, kalitsounia etc.). Four Cretan cheeses are recognized as P.D.O. products: Graviera Kritis, Xinomizithra Kritis, Pichtogalo Chanion and Xigalo Sitias.